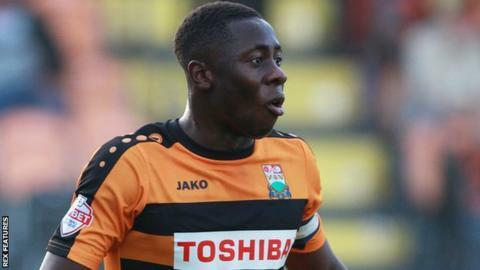 Barnet have transfer-listed Andy Yiadom after the defender rejected the club's offer of a new contract. Mauro Vilhete, 22, who is on loan at Boreham Wood, and Ben Tomlinson, 26, have also been made available. Yiadom, 24, has made 161 appearances for the Bees since joining them in January 2012, scoring 11 goals. "As he is out of contract this summer, we felt that it was best to make Andy available now," manager Martin Allen told the club website. "He has been inspirational and has not only been an excellent player, but is a great person. "He has a good character, an excellent work ethic, and a desire to better himself and will be sadly missed, but we have to evolve and move on." Striker Tomlinson has been recalled from a spell at Tranmere and Allen is willing to consider a fresh loan or permanent move for him.